Here are a few rear trunk shots. Could that possibly be Body Shutz under the paint? Yes, another Nepal Orange 76! Nice car. I have the rear reflector still in place as its a pain to fix those holes! Yours still has the decals atleast as mine were ripped off leaving a shadow mark. Thanks! (IMG:http://www.914club.com/bbs2/style_emoticons/default/smile.gif) My reflector just had to go, with the intermittent solenoid it was impossible to take off the top and store it in the trunk. Does everyone know that the chassis number is actually a code with embedded meaning about your 914? What about the 914's that don't have this stamped code anywhere?? Thanks to Dave too, who will soon become the member of the fugliest set of foglight grills! i have had two 1970 914's (four cylinders) the first was about serial #1600 or so, and the latest is serial #1300. On both of the them, the muffler heat shield is screwed to the trunk floor, later cars got them wleded in place. Both early cars I had had minimal seam sealer in the trunk. The earliest had almost no sealer at all, many seams on the shock mount tower had none what so ever! Is this a sign of an early car, or variation during production (ie Hans the sealer guy took the day off) i do not know? But lack of sealer or minimal sealer was found on both my early cars. The 1600+/- serial number car had a build bate of nov or Oct 1969 per the door sticker, the #1300 car door sticker is not present. On my #1600 car, dispite a letter from the factory (per my request) stating it was a USA spec car, had no vapor recovery system, no carbon can, no hoses, no holes for hoses, even the fan housing boss for the vapor line was not drilled out. Forget if the 1300 car has vapor system of not, it is not at my house right now, so I will need to check it out too. I bet the early cars rust more, with the lack of seam sealer. I've seen 914's w/almost NO sealer & my '72, which "Hans" must have been having a good day with the sealer - looks like he used more than his alottment! 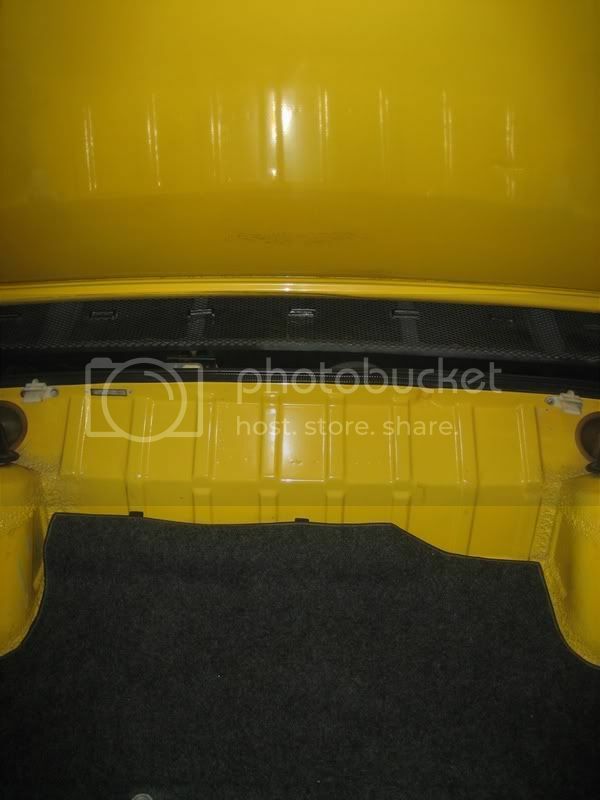 Maybe DaveP will chime in to verify...I dont think the 76 cars had the chassis # stamped into the rear trunk floor ...but it does appear on the skinny riveted plate on the pass side wheel well (below the tire board) in the front trunk and also on the Karmann drivers door pillar plate. The decoder above works on the the late cars too. Umm, Brant - gorgeous finish! BTW, you're missing some trunk plugs & what is up with the lights wiring? sorry pat, I was crashing the thread. the wiring is because its a race car. Brant - interesting. I keep learning here! With that in mind (and I know ounces are important in racing), how did you determine the spots to be drilled on the hood? Obviously, structural rigidity is not paramount for a hood. Yeah, I know, this isn't CW stuff, but I'm curious! in doing that I learned that the sheetmetal alone is way too flimsy to support itself. I had to go back with balsa wood strips on the rear hood to give its shape back. so when I got around to doing the front hood, I knew it would never withstand the aero force at speed with all of the bracing gone. I knew that I couldn't gut it completely... so decided to drill. this is backed up by the fact that they are the first thing to kink or show damage from any accident, and that the diagonals support all of the frontal force. so the diagonals were left alone. and then all of the rest of it, was just drilled to the biggest hole I could fit relative to the size of the area being drilled. I just crawled under my car - a '74 and looked at the mysterious square. It has absolutely nothing attached, it's just a square that protrudes into the trunk. It's just over the muffler heat shield. Does that answer the question? ?